Karnata rulers are known for building large number of temples. Right from Cave temples to temples built by Naiks. Karnataka is known for temple architecture. 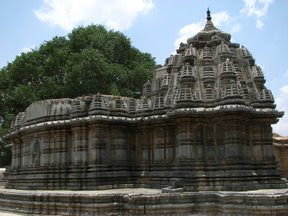 The unique thing about Karnata temple design and building is that it incorporates various styles of temple building existing across the country right from north to south, east to west. Some of the forms can b e found only in the place of origin and Karnataka. Let us study the styles used in Karnataka temples after 10th century AD as more information available to distinguish the different styles available from this period. omdakkeya alam hara sahita …. Which shows that not only that architects of Karnataka not only built temple, they knew styles built in other parts of the country and experts in them as well. The Kupputur inscription of Kottisvara temple says. (within this village kuppatur) was built , as if by visvakarma himself , out of sublime devotion for the lord of the Kailasa mountain, the elegant equipoised and shapely temple of Kottisa -Bhava , freely ornamented with Dravida , Bhumija and nagara and with Bhadra offsets manipulated in many ways. The above inscription shows that architects not only used the various styles , but also mixed them to get a style of their own. The Typical North Indian Temple with Curvilinear sikhara spire topped by amalasaraka (Myrobalan) . Nagara style begins with Kushans and started peaking with Guptas until Muslim invasion in 10th century AD. The Nagara form is defined in Aparajitaprccha (Western Indian Maru – Gurjara Manual) and Kamikgama (south indian Saivait work). The the Later Kamikagama definition of Nagara styles is not accurate , it seems to mistake Kalinga type for Nagara Style. The Karnata architects seems to stick to the authentic Nagara styles. We have to note that Southern counterparts of Karnataka architects calls karnataka styles as Nagara style(Except Kamikagama). 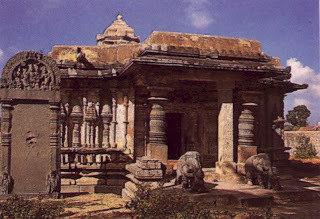 The Example incorporating this style of architecture is Kasivisvesvara Temple at Lakkundi and a shrine contemporary with it in Gadag, the surya temple in Trikutesvara Group. The Dravida style is the style employed in south India. The Samaranganasutradhara and Aparajitaprccha deal with Dravidan style. Again kamikagama view of Dravida style is different from other southern works. The Dravida style consist of octagonal from the base to the final or atleast for its superstructural components. The Karnata temples dont seem to follow this defintion strictly and they seem to have seprate style of their own. 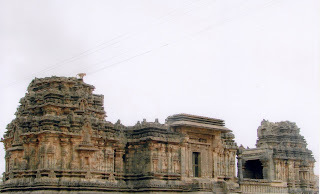 One example of Dravida style is Chenna kesava temple Marle. Bhumija style is from malava Country. This style was brought to karnataka by Seunas . This style is unknown in other parts of South. The Aparajitaprccha and samaranganasutradhara defines this style. The Shikaras consist of Storied arrangement of Kutas or srngas placed over miniature stambas, arranged in rows creating a illusion of vertically thrown necklaces of gigantic beads. 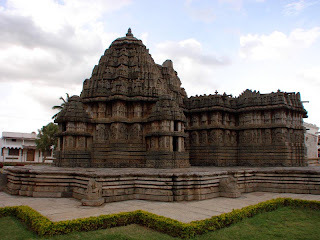 The Siddeshvara temple of Haveri and saraswati temple of Gadag are good examples of this style influence. Vesera style finds no mention in Northern texts.Kamikagama mentions this style as hybrid between Nagara and Dravida. But the jury is not out yet, There is a lot of discussion about what is vesera style and when it started. The style has round eliptical buildings or starting with square and ending with neck. This style is used by Chalukya s and Hoysalas. The Vesera style exist everywhere in Karnataka. The vesera style is also known as chalukyan - Hoysala style and also Karnataka style. The sadashiva temple Nugihalli is a good example. The style is been defined as storied pyramidal buildings surmounted by high temple with walls, cupola and finial. This is from Berar which forms the junction of Seunadesa ( Bhumija Style), Karnata( vesera Style) and Tilangadesa (Kalinga Style). The Style is a combination of vesera with Bhumija and Kalinga overtones. Miniature shrine in chenna Kesava temple at Belur is good example of Vrata influence. Kalinga style is defined by Laksanasamuccaya and Aparajitaprccha. The Kamikagama defines Kalinga style ,but temples in Kalinga does not see ms to follow the parameters. The main style of kalinga is nagara ,but with tiered pyramidal roof. Sri Lakshmi Narayana temple of Hosaholalu is a example of Kalinga influence. So the Styles employed by Karnatka architects in the temple need an extensive study and especially the Vesera and dravidian style. The Karnataka style which started as dravidian style has grown into style of its own.